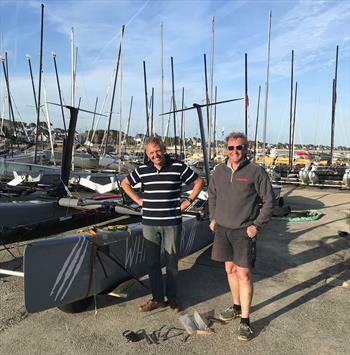 Both of the Vampire Project boats assembled at Yacht Club de Carnac after the long drive up from a valuable winter training programme at Pro Vela in Spain. The flying boat fleet at Eurocat usually comprises of an America’s Cup style course, laid with a reaching start and bear away onto the downwind leg. In the light winds the Phantoms got away really well on the foils whilst the Vampires were hunting for more wind to take off. After two laps Robert/Dorange (Phantom) were followed by Sunnucks/Self (Vampire) then Tellier/Triguer (Phantom) and last of all Stoneham/Ellis (Vampire). After a short delay a sea breeze of 8-10 knots came in and the Vampires joined in the foiling. This allowed them to hit speeds of 20-24 knots on the reach and powered thorough the Phantoms who were still needing kites downwind. The Vampires also foil upwind, much like a Moth with windward heel, the rest of the day went to whichever Vampire made the least mistakes. This was Kyle Stoneham and Dan Ellis, finishing the day with a 2 point lead over William Sunnucks and Mark Self. The Grand Raid was scheduled for Sunday, after an early briefing and much deliberation the course round island of Houat was set, a windward start with all 140 boats on 1 line to an inflatable off of the club then a bearaway to Buglet, broadreach to south Quiberon gate then thread the passage around Houat and back the same way. The Diam 24s led the 1 mile beat to the upwind mark followed by Brett Burville and Max Puttman from Australia in their F18 Edge, the Vampires were not willing to be shown the way and very quickly overhauled the leading boats after the bear away, racing each other at speeds of 30+ knots through lobster pots and other obstructions. Stoneham and Ellis pulled out a lead round Buglet and through the Sud Quiberon gate until some cloudy navigating threw doubt into which passage through the rocks was required. By this time the waves were pretty huge with 18-20 knots wind over tide and very close together. Visibility through the spray was near impossible and a gybe back towards the land allowed the Nacra 20 of Yvan Bourgnon to come through followed closely by the Vampire of Sunnucks. After passing through the passage the water flattened off and Stoneham/Ellis got foiling to briefly regain the lead round the island and through the turning gate where the large sea state returned to batter the boats coming round. Sunnucks/Self made a good call to insert straight boards and sail conventionally until the water flattened enough. By this time the Nacra 20 had taken a commanding lead back towards Quiberon Gate followed by the Diam 24 Oman Sail helmed by Stevie Morrison. Sunnucks made the change to t-foils again once the sea state levelled slightly, then quickly reeled in the leading boats and took a well fought victory for the Vampire, racing 35nm in less than 2 hours. Monday dawned with a similar offshore breeze 18 gusting 22 knots. The Phantoms put their jibs up on shore but didn’t follow it up with anything else, so the Vampires and Diams sailed out to the yellow course. A conventional windward-leeward course was laid with top and bottom gates. Race 1 saw Sunnucks trigger a little early and scream down the line starting to leeward of Stoneham who managed to climb and take a lead through the top gate, bearing away up to 33 knots downwind. Gybing on the foils is quite easy in this much breeze, but retrieving the old foil can be problematic – this proved the case for Stoneham/Ellis on the 2nd gybe into the gate where they got stuck on 4 foils and lost the lead. Sunnucks was now ahead but close enough to make this a race. Stoneham/Ellis chased hard but Sunnucks made less mistakes and pulled away for the win. Unfortunately the foil retrieval problem reared its head again, but this time permanently for Sunnucks meaning he was denied the chance to challenge for the series victory for round the cans. After six handicap course races in a full range of conditions, the littlegreenselfstorage.com Vampire of Kyle Stoneham and Dan Ellis narrowly took the top spot by 1 point after a mechanical failure on Sunnucks’ boat. The main event, and the reason the Vampires went to Eurocat is of course The Grand Raid and overall victory in that went to William Sunnucks who sailed superbly to round off a successful trip to Europe for the Vampire Project. Big thanks to Pro Vela, Yacht Club de Carnac and Graham Eeles for keeping these awesome boats race ready. The Vampire class rules are currently being drafted and will be released soon with much interest from Australia, USA, France and parts of the U.K. you can expect to see more of this concept in future. See us at Solent Forts Race, Rond Texel, Foiling Week Garda and more later this year.